Acne scars remain a challenge for clinicians and patients alike. The dermal pathology associated with atrophic acne scars; makes it essential for the clinician to choose a modality that can effectively reach the appropriate depth of both superficial and deep scars. Various methods such as chemical peeling, dermabrasion, dermal fillers and surgical correction of the scars have been tried in the past; however, adverse effects such as incomplete improvement of the scars, worsening of scars, and pigmentary changes have limited their use. The 1540 nm, non ablative, erbium:glass (Er:Glass) laser is a mid-infrared laser said to be useful in the treatment of atrophic acne scars. ,,,,,, The Er:Glass has the ability to reach a depth exceeding 1000 μm at high pulse energies. In a recent analysis carried out by Sardana et al. they revealed that even though the mean depth of penetration achieved by the Er: Glass (679 μm), was less than that of the commonly used fractional ablative lasers (Er:YAG and CO2), on facial skin, the difference in the histological depth of the three above mentioned fractional lasers (Er:Glass, Er:YAG and CO2) would probably be similar for superficial atrophic acne scars. Furthermore, the 1540 nm wavelength is primarily absorbed by water but also targets the sebaceous glands and surrounding dermal matrix and minimal absorption by melanin makes the laser essentially safe for the treatment of dark skinned individuals. We report the usage of the Lux 1540 Fraser@ (Palomar MedIical Technologies, Burlington, Mass); a 1540-nm, non ablative, fractional device in 25 patients with atrophic acne scars. The aim of the study was to evaluate the efficacy and safety of the 1540 nm Er: Glass laser in the treatment of facial atrophic acne scars. 15 women, 10 men, ages 24-52 years, mean age 30.08 years, skin phototypes III-V with atrophic acne scars (rolling, boxcar and ice pick scars) were identified and determined eligible for the study. The 10 mm tip (100 microbeams/cm 2 ) which helps in deep coagulation was used for the deliverance of light beams, and treatment sessions were carried out every four weeks. The fluence varied from 40-55 mj/mb, depending on the size, shape, depth of the scar and skin thickness. The initial fluence was 40 mj/mb in all cases, and a minimum of 2 passes were given at pulse duration of 15 ms.The passes were delivered with 25-30% overlap. Therapeutic outcomes of the treated areas were conducted by physicians evaluation of comparative photographs using a five point scale, wherein, 0-no change; 1-slight improvement (0-25%); 2-moderate improvement (26-50%); 3-significant improvement (51-75%); and 4-excellent improvement (>75%). A patient's self-assessment of treatment outcome was also evaluated using the same scale as mentioned above. There was substantial improvement in the appearance of box car and rolling scars, where a decrease in the severity of the scars was noted as a reduction in the depth of the scars, softening of scar contours and a better skin texture [Figure 1]a-j. 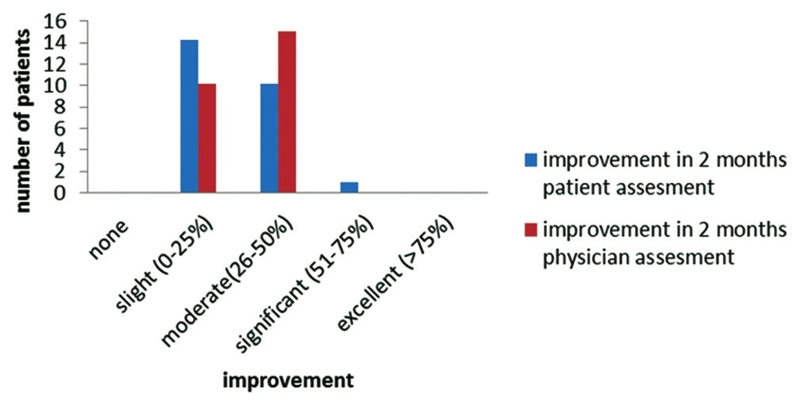 At 2 months [Figure 2] the physician's evaluation revealed slight improvement (up to 25%) in 10 patients and moderate improvement (26-50%) in 15 patients. 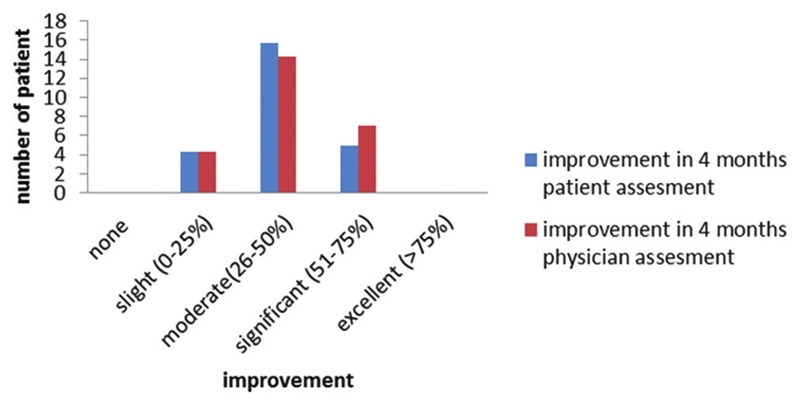 The patient self assessment at 2 months showed slight improvement in 14 patients, moderate improvement in 10 patients and significant improvement in one patient. Physician assessment at 4 months [Figure 3] showed a slight improvement in 4 cases, moderate improvement in 14 cases and a significant improvement was noted in 7 cases, whereas the patient assessment revealed a significant improvement in 5 cases. Our study employed a patient and physician dependent scoring system, which may not be an accurate indicator of treatment outcomes. There is an urgent need for more objective methods of analysis of acne scars and treatment outcomes in studies of this kind. Another lacuna of our study was the lack of histological assessment of the scars, which would have provided us with a more precise measurement of the improvement of the scars. Even though optimal treatment parameters are yet to be determined, the fractional Er:Glass due to its clinical efficacy and low complication profile, appears to a promising treatment modality for atrophic acne scars in individuals of darker skin types (Fitzpatrick skin types III-VI). 1. Sardana K, Garg VK, Arora P, Khurana N. Histological validity and clinical evidence for use of fractional lasers for acne scars. J Cutan Aesthet Surg 2012;5:75-90. 2. Hu S, Chen MC, Lee MC, Yang LC, Keoprasom N. Fractional resurfacing for the treatment of atrophic facial acne scars in Asian skin. Dermatol Surg 2009;35:826-32. 3. Alster TS, Tanzi EL, Lazarus M. The use of fractional laser photothermolysis for the treatment of atrophic scars. Dermatol Surg 2007;33:295-9. 4. Weiss R, Weiss M, Beasley K. Long-term experience with fixed array 1540 Fractional erbium laser for acne scars. Kissimmee, FL: Abstract presented at American Society for Laser Medicine and Surgery Conference; 2008. 5. Hasegawa T, Matsumira T, Mizuno Y, Suga Y, Ogawa H, Ikeda S. Clinical trial of a laser device called fractional photothermolysis system for acne scars. J Dermatol 2006;33:623-7. 6. Kang WH, Kim YJ, Pyo WS, Park SJ, Kim JH. Atrophic acne scar treatment using triple combination therapy: Dot peeling, subcision and fractional laser. J Cosmet Laser Ther 2009;11:212-5. 7. Chrastil B, Glaich AS, Goldberg LH, Friedman PM. Second-generation 1,550-nm fractional photothermolysis for the treatment of acne scars. Dermatol Surg 2008;34:1327-32. 8. Lee HS, Lee JH, Ahn GY, Lee DH, Shin JW, Kim DH, et al. Fractional photothermolysis for the treatment of acne scars: A report of 27 Korean patients. J Dermatolog Treat 2008;19:45-9. 9. Cho SB, Lee SJ, Cho S, Oh SH, Chung WS, Kang JM, et al. Non-ablative 1550-nm erbium-glass and ablative 10 600-nm carbon dioxide fractional lasers for acne scars: A randomized split-face study with blinded response evaluation. J Eur Acad Dermatol Venereol 2010;24:921-5. 10. Bedi VP, Chan KF, Sink RK, Hantash BM, Herron GS, Rahman Z, et al. The effects of pulse energy variations on the dimensions of microscopic thermal treatment zones in non-ablative fractional resurfacing. Lasers Surg Med 2007;39:145-55. 11. Lupton JR, Williams CM, Alster TS. Non-ablative laser skin resurfacing using a 1540 nm erbium glass laser: A clinical and histologic analysis. Dermatol Surg 2002;28:833-5. 12. Graber EM, Tanzi EL, Alster TS. Side effects and complications of fractional laser photothermolysis: Experience with 961 treatments. Dermatol Surg 2008;34:301-7. 13. Dainichi T, Ueda S, Fumimori T, Kiryu H, Hashimoto T. Skin tightening effect by a fractional laser treatment II: Remodelling in animal skin. Dermatol Surg 2010;36:71-5.